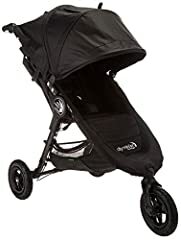 Don’t let the name fool you – this stroller isn’t meant for jogging, although it does have a three-wheel design that makes for a smooth ride around city obstacles like cracked sidewalks and crowds. 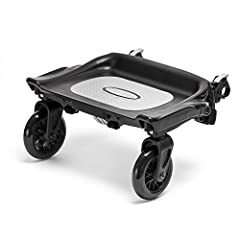 Because it’s lightweight, and easy to fold with one hand into a compact unit, this stroller is ideal for small trunks and public transportation. 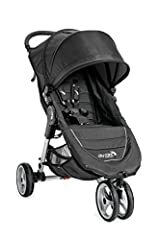 The City Mini can easily tip backward if your baby is in the full recline position and you’re not supporting the handlebar, or if you pile shopping bags on the unsupported handle. The handlebar height is also not adjustable for parents. 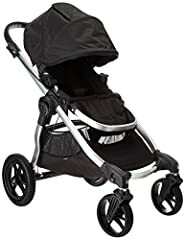 “This stroller is lightweight and sturdy, a breeze to unfold and fold, and looks great. The seat lays all the way back – great for newborns – and is easily adjusted to sit upright. We go for many walks around town with it.” – S.D. “Only stroller we found with a long enough stride for a tall mom. I bumped my feet with the rest!” – Sarah S.